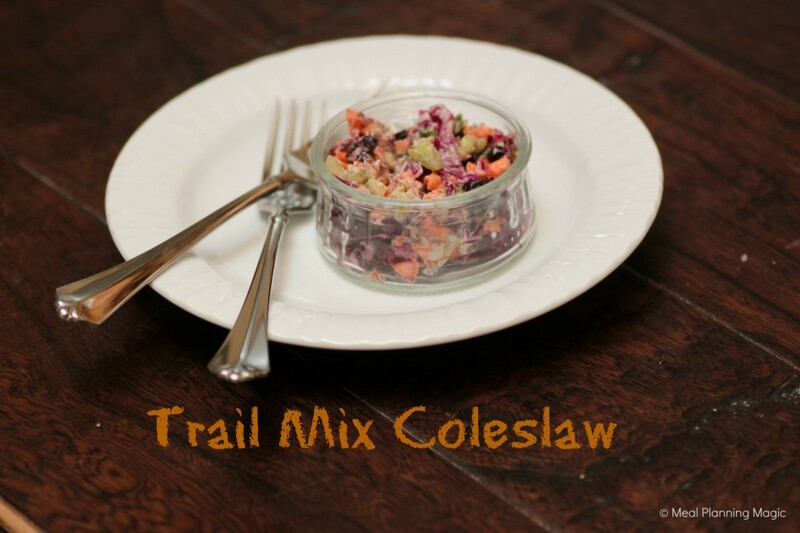 Trail mix coleslaw is an easy healthy side dish, perfect for packing into lunch boxes! This healthy coleslaw recipe gets sweetness from dried fruits and fun color and crunch from veggies and protein-packed nuts. Come this time of year, more than halfway through the school year, we seem to get ourselves into a lunch time rut. 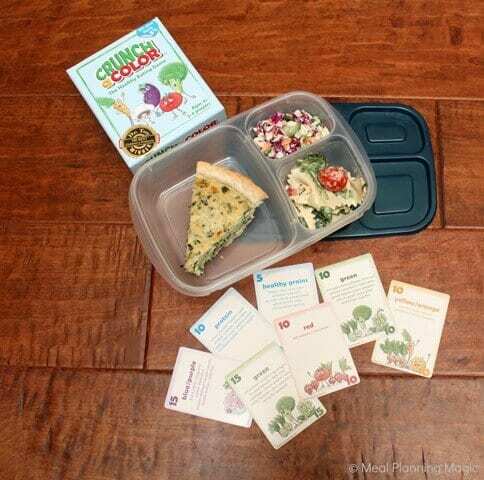 So I was excited when Jennifer of Crunch A Color contacted me about the Healthy Lunch Challenge she was hosting along with Easy Lunchboxes to inspire some fun and healthy lunches to make a great finish to the school year. And who says packing lunches needs to be all about the kids anyway? These ideas are good for anyone! If you’ve been reading my blog for a while, you may remember my review of the Crunch A Color game. The idea is simple: rack up points for eating healthy foods, primarily fruits and vegetables! 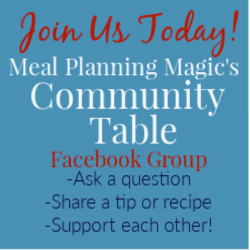 It’s a fun way to keep track of what healthy foods you and your family eat throughout the day. The winner is the one with the most points! This lunch really racked up some point in the Crunch-A-Color game! A total of 75! I used my Easy Lunchboxes to make up a quick lunch for my daughter to enjoy at school. The first one I made up included a slice of homemade spinach quiche, a trail mix coleslaw salad (recipe below) and a creamy peppercorn pasta salad with grilled chicken, tomatoes and spinach. Make the quiche using your own favorite recipe or try these Make-Your-Own Mini Quiches (using real whole eggs if you like instead). Not too bad on this lunch either–a total of 50 points! My second lunch was a fresh garden salad with spinach and mixed greens, tomatoes and sliced cucumbers plus a rotisserie chicken salad and whole grain crackers. So easy, yet filling! You can use any favorite chicken salad recipe for this tasty lunch. Visit your local grocery store deli, where you can often find prepared salads and other yummy foods. What I like about prepared salads is that they are made with fresh ingredients but usually include a variety of different vegetables. This allows us to eat a nice variety with minimal effort. Plus, I’m not left with a lot of leftovers if I have to buy a bunch of several different items. It’s a great way to try different foods and taste new things too! I really love the trail mix coleslaw made by my local grocery store, but I could not find a recipe online that was the same, so I decided to create my own. Trail mix coleslaw is SO easy and delicious. We had ours on tacos one night but I also enjoyed some the next day just by the forkful. I love that it has so many different colors in it too! You can see that the measurements are somewhat broad. That way you can customize it to your family’s preferences. Add more nuts if you like or maybe a bit more cucumber. It’s up to you! 1 cup dried fruit such as raisins, craisins, dried cherries, etc. In large bowl, ccombine all vegetables. Set aside. For dressing, combine dressing ingredients. If you do not have vanilla yogurt, you may use plan and add 1-2 tablespoons sugar to dressing mixture. Pour dressing mixture over slaw mixture. Be sure to check back next month where I’ll provide the link to all the participants in this lunch roundup. Jen will be featuring them in her April article on Jamie Oliver’s Food Revolution, the Huffington Post and lots of other places on the web! Hopefully the great ideas that are shared will help inspire you to get out of your lunch rut and try some delicious new combinations. In the meantime, you can also check out my Lunch Box Ideas Pinterest board here for more delicious lunch ideas! Disclaimer: I was not compensated for this post. 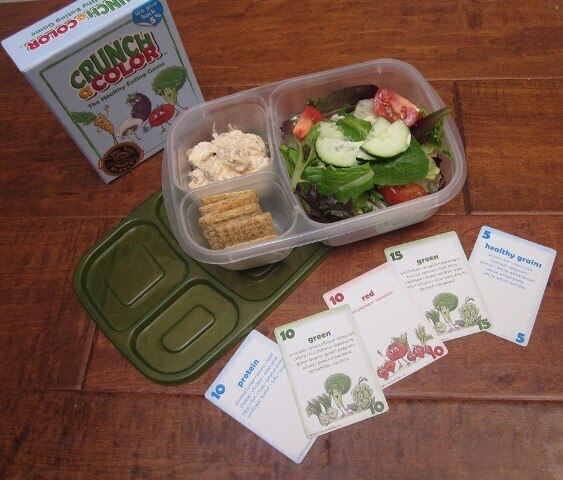 I am just a happy customer of Crunch A Color and Easy Lunchboxes! Glad you found it helpful! YEs, I think we can all use a recharge every once in awhile!